Our last day in Osaka arrived and we sadly looked forward to our last full day in Japan before returning home and ending this month long vacation to some of the most wonderful places on Earth. For our last day we had something special planned, something we viewed as a "must" for our trip to Japan: A visit to Peace Park in Hiroshima, Japan. 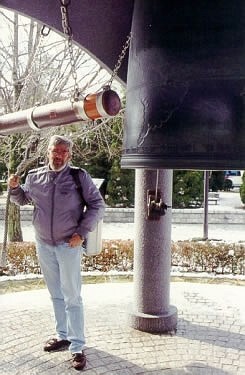 I can't tell you when it happened, or exactly why it happened, but one of the things I've always wanted to do (and I set a goal for myself to do it) was ring the Peace Bell in Peach Park. Hiroshima was the scene of one of worst nightmares man could ever imagine, the likes of which I hope this world never sees again. In the flash of a light thousands died and millions suffered. That suffering continued for years and, for some, it continues even today. 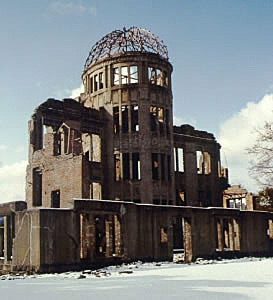 Because of what happened at Hiroshima that one August morning the world and its people will never be the same again. I sincerely hope that the belief we, the Americans who dropped the bomb, had that dropping such a catastrophic bomb would end the war sooner and save countless lives on all sides was a correct one. Ringing the Peace Bell for Anne and I would be our vote, our little voice, for world peace among nations and all mankind. We had looked forward to this day for a very long time and it had finally arrived. We awoke early and did our final packing in preparation for leaving. Kako would drive us to the train station where we would catch the Shinkaseen bullet train to Hiroshima. We were in for somewhat of a surprise though. During the night it had snowed and there was several inches of snow on the ground and streets. We made it to the train station in time for our train only to find that it was delayed. We waited patiently and worried that it might affect our trip. Hiroshima was a full 200+ miles in the opposite direction from Tokyo and we had to make it back to Tokyo that night for our flight home the next day. After a short time there was an announcement concerning our train over the PA in Japanese of course. Thank goodness Kako was with us and translated the bad news immediately for us. Our train to Hiroshima had been canceled due to the inclement weather with downed trees and lines between Osaka and Hiroshima. Anne's and my heart fell right to the floor with that news. We had come so far and were in sight of our goal only to have it snatched away by some stupid snow storm. We were both devastated and disappointed. Coming to grips with the situation and figuring there was nothing we could do we changed our Hiroshima tickets for tickets to Tokyo. We tried to console ourselves by thinking that we'd have most of the day sightseeing in Tokyo, but that didn't help eliminate the great disappointment we felt. Once again we found ourselves waiting by the tracks for the train bound for Tokyo to arrive when another announcement came over the PA. Again, we were thankful that Kako was there to interpret. This announcement brought good news. The trains to Hiroshima were running again and one would be along in a short time. We quickly changed our tickets back to Hiroshima and we both felt a great burdened lift from our shoulders. 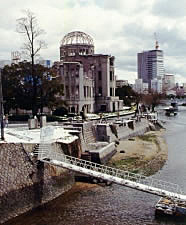 At this point we knew one thing: We would get to Hiroshima and we would ring the Peace Bell. I really didn't care if we couldn't make it back to Tokyo that night or not and missed our flight home. There's always another flight, but there may never be a chance to ring the Peace Bell again. The train arrived and we were finally on our way to Hiroshima. 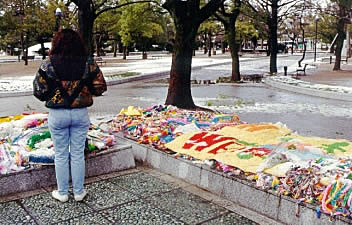 Arriving in Hiroshima we stowed our luggage and took a cab to Peace Park. 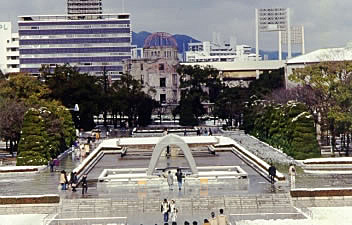 Peace Memorial Park is located in the center of Hiroshima not far from the center of the bombed area. 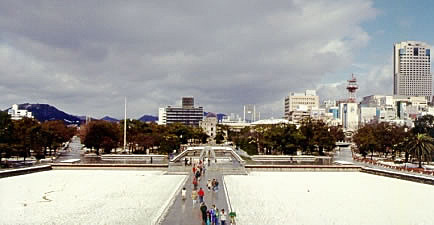 The photo left shows the main park area with the eternal Peace Flame monument and, behind that, the remnants of the Hiroshima Perfectural Promotion Hall, one of the only structures that withstood the atomic bomb blast. 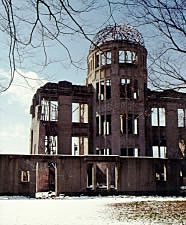 Today Peace Memorial Park houses the Peace Memorial Museum, a must see for any visitor to Japan. It contains many interesting exhibits relating to the atom bomb and the actual bombing of Hiroshima and the after effects of the bombing. Peace Memorial Park and the museum is dedicated to the children who lost their lives in the bomb blast and its aftermath. Inside the museum there are many moving reminders of the devastation a single atomic bomb can have on a population. One of the most thought provoking for me was the sight of granite steps showing the shadow of a person who had been sitting on the steps when the bomb exploded at 8:15 a.m. the morning of August 6, 1945. Another was of a watch stopped at the precise moment the bomb detonated. Throughout the park there are various monuments. One of the most striking and memorable is to a little girl who died from the after effects of the bombing in 1955. In the hospital she began to make little paper oratani figures thinking they would keep her alive, but they didn't. 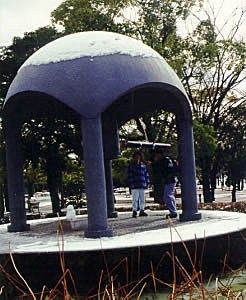 Today the monument is a favorite amongst the Japanese school children. In preparation for their visit they make the little paper oratani figures and leave them at the monument as a tribute to the little girl. One cannot stand by this monument and not be affected by it. This, perhaps, is one of the most recognized buildings in the world today. 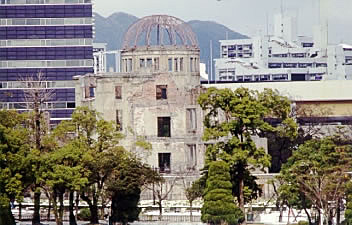 Anyone who has ever seen a documentary on Hiroshima has certainly seen this building before. 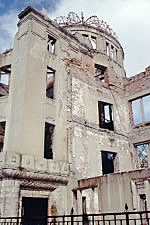 The epicenter of the bomb's blast was only about 450 feet southeast and 1,800 feet above this building. The 30 occupants were killed by the blast but, somehow, the building survived. Inside of the museum they have a model of Hiroshima showing the city following the blast, and this building is the only standing structure with the exception of a few smokestacks. It stood out amongst a backdrop of total devastation. 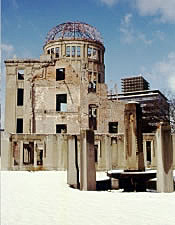 Anne and I walked around the building to see it from all perspectives as it was hard to imagine that this one building could withstand such devastating forces as those caused by the atom bomb. Somehow it did manage to survive and serves today as a reminder of how that day in August 1945 affected everyone living today. Having visited the museum and walked throughout the park there remained but one thing for Anne and I to do: Ring the Peace Bell as a symbol of our want and desire for world peace for all mankind. 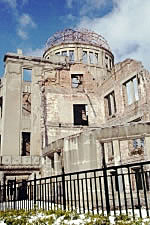 This was the reason we came to Hiroshima in the first place and it would be the last thing we did there. the hearts of its peace - loving donors. 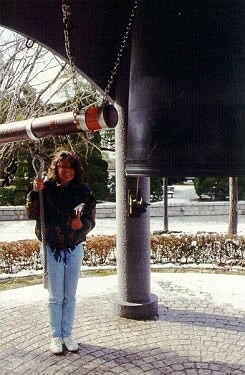 step forward, and toll this bell for peace! Having achieved our goal of visiting Peace Memorial Park, its museum, and ringing the Peace Bell Anne and I found that we still had some time and daylight left before our scheduled train back to Tokyo. We got adventurous and decided to visit Miyajima, the Scared Island. This was no easy feat. First we needed to take a train to Miyajimaguchi and then a ferry across to the Miyajima. When we boarded the train we had no idea if it was the right one or not. Fortunately for us it was and we arrived at our destination quickly. 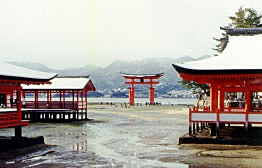 Miyajima is one of the most scenic spots in all of Japan. Exceptionally beautiful the island has been held sacred since ancient times. 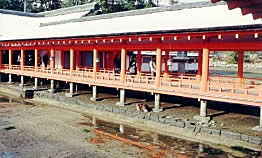 It's most noticeable feature is the huge vermilion painted Torii gate, built in 1875, which stands at the waters edge. 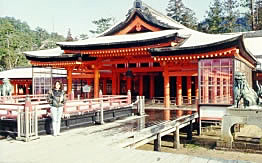 It is the largest torii gate in Japan standing 53 feet high. It stands guard over Miyajima's most famous attraction the Itsukushima Shrine. Being a sacred island no one was allowed to give birth or die on the island in ancient times. The pregnant and sick were immediately ferried to the mainland. 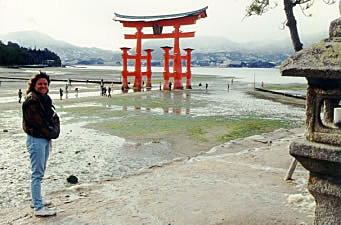 The torii gate and Itsukushima Shrine are built on the water's edge so that at high tide the water actually comes under the gate and shrine. As you can see by the picture (left) we missed the high tide, but it was still beautiful.